Art Palm Beach celebrates its 20th-anniversary with very appropriate selections from “100+ Degrees in the Shade: A Survey of South Florida Art.” An exhibition organized by Guest Curators Noor Blazekovic/Irreversible Magazine, and Jane Hart/Lemon Sky Projects + Editions. The highly acclaimed, multi-venue extravaganza debuted at (9) nine Miami-Dade and Broward County venues during Art Basel Miami Beach 2015. A carefully selected sampling of the 170 artists in all media in the original show will showcase at the fair. 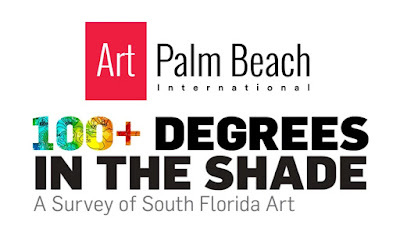 Perez Art Museum’s curator, Rene Morales and Jane Hart will lead a panel discussion on 100+ Degrees during the fair on Friday, January 20th from 2-3pm. 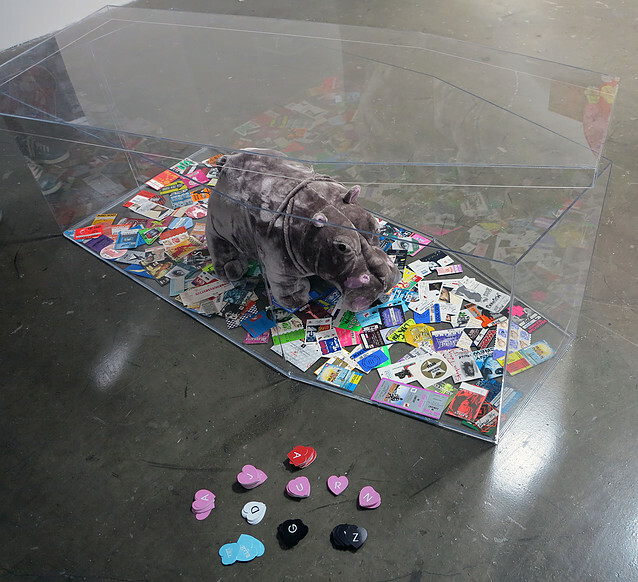 This impressively expansive initiative included an array of works in all media. Some of the South Florida’s finest artists were invited to participate. Sculpture, installations, mixed media, painting, performance, photography, works on paper, and video allowed art lovers and collectors to realize the powerful force of the South Florida creative community. The show placed emphasis on impact, innovation, and inspiration; with an integration of the lush tropical urban environment inherent to South Florida. 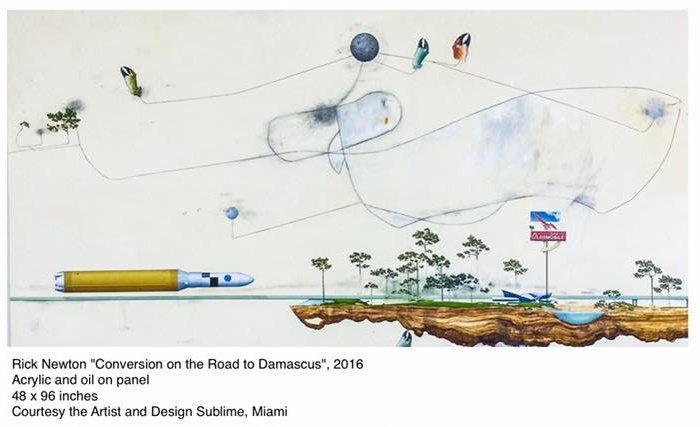 A total of 170 participants – including internationally and nationally recognized, mid-career, and established artists – chronicled 30 years of South Florida’s art development and evolution. 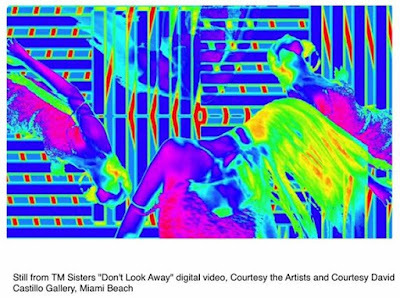 Art District, Artforum, New York Times, El Nuevo Herald, Miami Herald, New Times, and Sun Sentinel published rave reviews of the exhibition. Curator and art historian Gean Moreno published a full color, 224-page, hardcover book in conjunction with the exhibition. The book includes texts by Erica Ando, Jane Hart, and Sandra Schulman. The fair will host a book signing by Jane Hart on Saturday, January 21st from 3-6 pm; signed copies are available for sale. Jane Hart, an award-winning independent curator, organized the show. 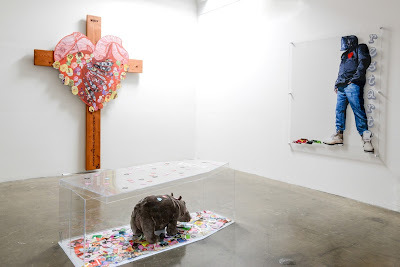 She has 30+ years of experience in the field of international contemporary art; including Director of the Arts & Culture Center of Hollywood and working with acclaimed artists like Doug Atken, Uta Barth, John Baldessary, Mike Kelley, Christian Marclay, Diana Thater, and Pae White. 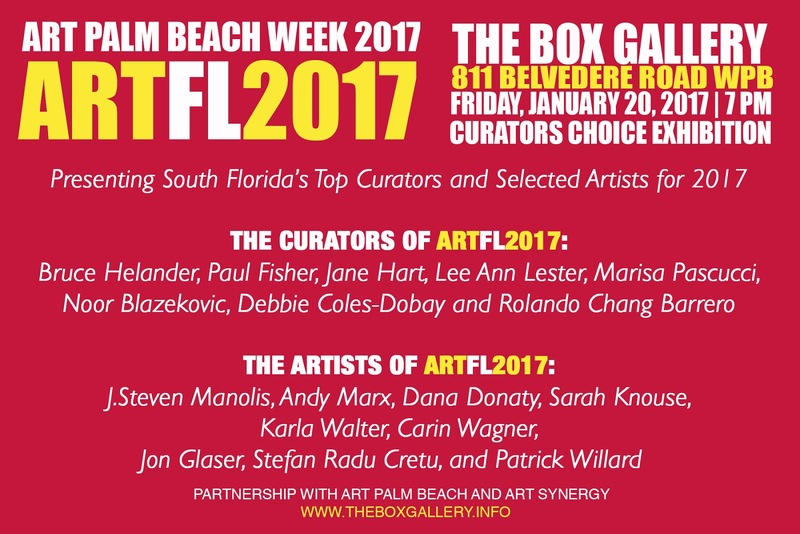 Join us at The Box Gallery in West Palm Beach for Art Florida 2017: Curators Choice when Rolando Chang Barrero brings together 7 of the top curators in South Florida and their choices of artists to keep an eye on. 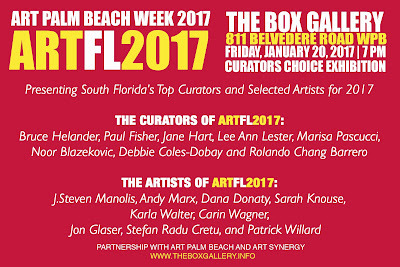 You are cordially invited to join us at The Box Gallery to pay homage and celebrate the achievements of Bruce Helander, Paul Fisher, Jane Hart, Marisa J. Pascucci, Lee Ann Lester, Debby Coles-Dobay, and Noor Blazekovic in a VIP Reception on January 20, 2017 from 7-10pm. Featuring the work of J.Steven Manolis, Patrick Willard, Andy Marx, Dana Donaty, Karla Walter, Carin Wagner, Sarah Knouse, Stefan Radu Cretu, and Jon Glaser. 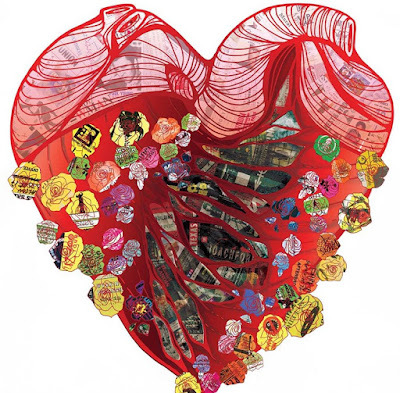 This exhibition is in partnership with Art Synergy, Art Palm Beach and Irreversible Projects. 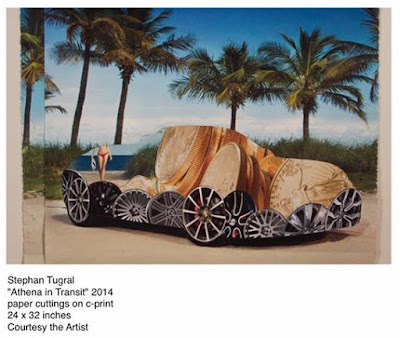 Renowned curator and gallery owner Rolando Chang Berrero tapped artist Patrick Willard aka W4, to show unique works from his ‘Life’ series at Art Florida 2017 at The Box Gallery. 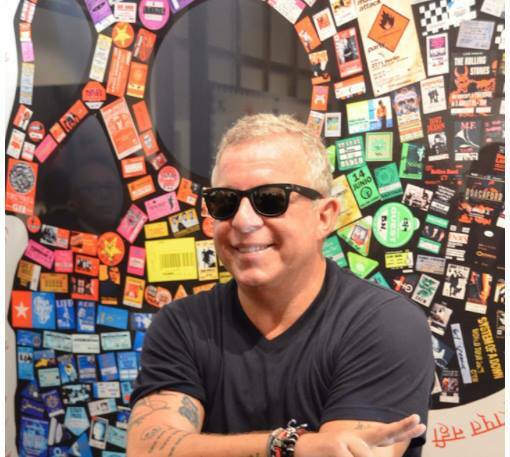 The artist is known for his one-of-a-kind art collages made with his personal collection of rare rock concert tickets, backstage passes & VIP laminates capturing a million magical moments from a lifetime spent traveling the world as a music journalist & TV personality. 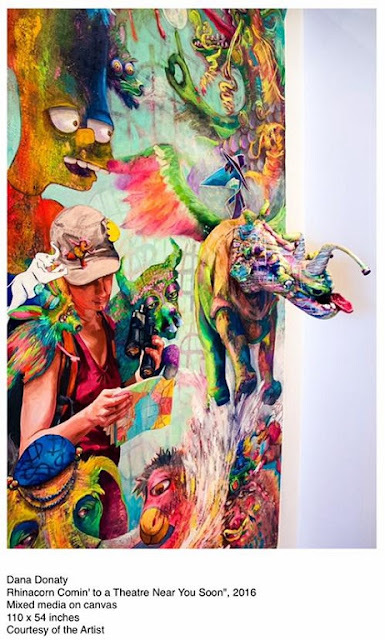 Patrick Willard, aka W4, is a French-born American artist who resides in Miami Beach. He has lived an uncommon life that allowed him to enjoy countless musical experiences across the globe, attending over 4,000 concerts and music events over the course of his career. He kept every shred of music memorabilia and precious concert memories, which he uses in the creation of his unique art pieces. The artist fashions his artworks into rock n’ roll inspired designs such as skulls, guitars, motorcycles, angel wings, hearts & more. 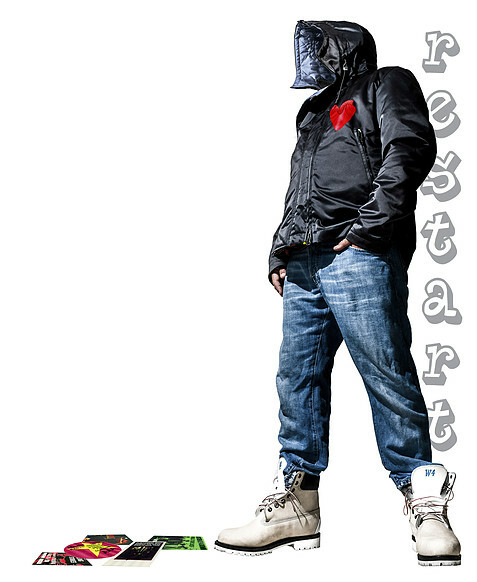 One of the pieces in this exhibition is a powerful faceless self-portrait known as ‘Restart‘. Through this piece, along with the complete LIFE installation including the cross, heart and coffin, the artist allows for life to be experienced by the individual viewer; to become aware of the transformation and cycle of life and death, rebirth and starting anew. Exploring the symbolism and deeper meaning of the work. 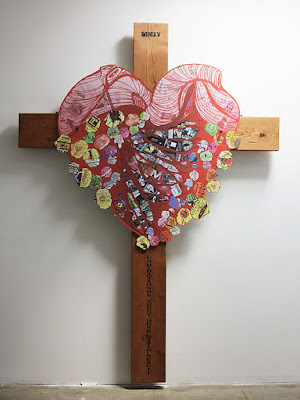 The heart on the jacket is the same as the art that has been crucified and has fallen into the coffin, filled with concert tickets and hearts of different colors denoting emotions on the spectrum; happiness, love, sadness, memories, melancholy, etc.